I have to admit that I've been surprised by the relative success of IDW's Artist Edition line of books. From what I've gathered, these sell in the low thousands at best. They do have a relatively high price point, but for the amount of effort involved in collecting all of the originals (in many cases; I think there were a some where they were able to get them all from a single source) it seems like a lot of legwork for a limited-interest product. I don't know that I've heard of any individuals who've purchased every one so far. In fact, most people I know consider themselves lucky to have one or two. Currently, I have the John Byrne Fantastic Four one and the Jack Kirby New Gods one. I got the Byrne one mostly because that was the work that got me hooked on comics in the first place, and I've really enjoyed studying all the nuances that clicked with me at a subconscious level all those years ago. I picked the Kirby one because of my ongoing research into Kirby's work in general. I passed on the Kamandi one... well, mostly because of money. As I said, these aren't cheap and it came out at a time when I didn't have the extra cash flow. 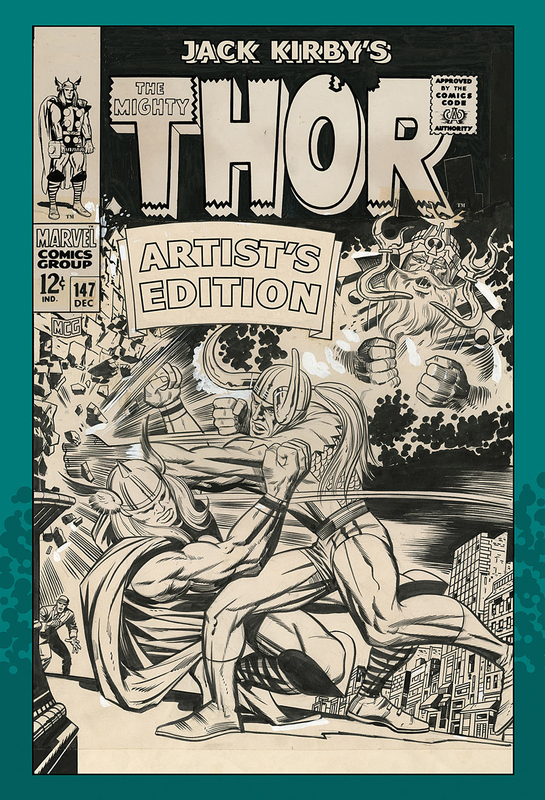 But now they're coming out with a book of Kirby's Thor. This I'm going to have to pick up! Honestly, I was never overly fond of Thor as a character, and while I've read Kirby's run on the book, I didn't find it as engaging as some of his other work from that time. Also, I'm really not a fan of Vince Colletta's inking. I always felt he was too light and feathery, especially compared to a Joe Sinnott or Mike Royer. That said, though, it's actually precisely Colletta's inking that's getting me to pick up this volume. See, Colletta was a practical inker. He held to the idea that comics were a largely disposable, mass market medium. His job was to ink a penciller's work so that it could be printed on cheap newsprint and visibly tell whatever that issue's story was. He wasn't making capital-A Art; he was a production man, cranking out work to meet a deadline. And because of that approach, he took shortcuts. He might leave background figures out, or he'd change a fully detailed figure to a silhouette, or whatever he needed to do to ensure the comic was completed on time. Originally, readers seeing the story never knew; they could just tell that his inking was a different style than Sinnott's. If anything, they might assume Kirby just threw more of himself into Fantastic Four and didn't care to add as much detail over in Thor. 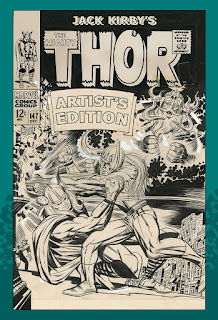 I had the pleasure of seeing the Charles Hatfield-curated Kirby exhibit in California last summer, and was able to see an entire Colletta-inked Thor story on the original boards. There were any number of fascinating changes visible, and having them all in one presentation really showcased how those books were produced. Thus, being able to see several whole issues together like this, I'm extremely eager to see how Colletta tackled other issues, but also how his approach to inking Kirby may have changed over the years this book covers. I'm thrilled that IDW is giving people like me the opportunity to study these works in ways that were almost impossible previously, and I highly encourage anyone with an interest in the comic production process to check at least one or two of these books as well to gain a better understanding of how some of their favorite comics were put together.